San Francisco: The archetypical Jeep may be the rock crawling, go-anywhere Wrangler, based on the vehicle that helped win World War II. But today, the top of the Jeep heap is the Grand Cherokee. Designed to fit in at the country club or on backcountry off-road venues, the Grand Cherokee offers comfort and amenities that Beetle Bailey can only dream about. The Grand Cherokee debuted as a 1993 model and got a substantial redesign in 1999. This 2005 Jeep is all new. The new Grand Cherokee uses a new body side to window proportion, with taller door panels and slimmer windows giving the impression of strength and protection. The new face integrates round quad headlamps into the hood, alongside the traditional seven-slat Jeep grille. The new tail lamps lean forward along the side of the vehicle, echoing the forward tilt of the tailgate. While the overall impression is the same as the old model, every detail has been reinterpreted. The Grand Cherokee’s new interior wears sharper edges along the dash and doors. Every surface is grained in various coordinated styles, and textured metal accents look contemporary and luxurious. The SUV-standard front pillar handgrips are cleverly integrated into the pillar itself. The white on black instruments reminded me of a diver’s watch. The attractive central console bulges sideways, upwards, and outwards. This design conveys power, like Popeye’s post-spinach muscles. The operation of the dials and switches is decidedly more upscale now. The seats are far more comfortable than before. One minor omission is the windows do not have an automatic power up feature, even for the driver. You can now select from three engines, including the mighty Hemi V8. You can pick one of three different four-wheel-drive systems, or skip them and opt for two-wheel drive. Numerous options are available for you as well. The base engine is a 3.7-liter V6, which has served admirably in the smaller Liberty model. It offers an adequate 210 horsepower and 235 lb.-ft. of torque. It replaces the venerable 4.0-liter inline six that dates back to the brands American Motors years. The middle engine in the family is a 4.7-liter V8, which is what my Bright Silver Metallic test car had (for $1,340). It has been updated, with dual knock sensors and improved noise, vibration, and harshness suppression. This hardy power plant puts out 230 horsepower and more importantly, 290 lb.-ft. of torque, 55 lb-ft, more than the V6. My tester got 14.3 miles per gallon using the recommended regular fuel. EPA ratings are 15 city, 20 highway. For real power, you can order up the corporate 5.7-liter Hemi V8, which churns out 325 horsepower and 370 lb.-ft of torque. My experience with this engine in other Chrysler division vehicles has been very grin inducing. If you want the simplest kind of all-wheel-drive, with no extra buttons or levers to activate it, the Quadra-Trac I system works just fine. The transfer case splits engine torque 48 percent front, 52 percent rear, and the Brake Traction Control System helps keep the car in line on slippery roads by automatically modulating brake pressure to the wheels. The Quadra-Trac II system has an active transfer case that uses input from sensors to determine how much the tires are slipping and automatically compensates for it. The system also has Throttle Anticipate, which can sense if you step hard on the gas pedal and can correct tire slippage automatically. The Quadra-Drive II system is the most sophisticated, and includes a 4-low gear for true off-roading. It employs electronic limited slip differentials front and rear. 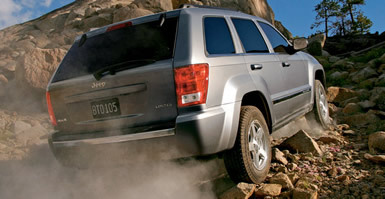 A new front suspension improves the ride and handling in the 2005 Grand Cherokee. Also, the steering response is better with rack-and-pinion rather than the old-fashioned recirculating ball system. And, of course, the new Jeeps wider track and longer wheelbase give it a bigger, safer footprint on or off road. My test car had just over $10,000 in optional equipment, so even though it was the lower level Laredo model, it was really more like the upscale Limited, but without the Limited’s chrome grille. It also, surprisingly, lacked automatic climate control. But it did have a $3,355 package with leather seats, power heated outside mirrors, a leather wrapped steering wheel, a power sunroof, steering wheel audio controls, and a 276-watt Boston Acoustics Premium Sound system. My car also had the rear seat DVD system ($1,200), with a fold down screen on the ceiling. Other options, like power pedals ($120) were handy, as was the $1,500 navigation system with its sharply rendered screen. With other items too numerous to list, the options pushed my car up to $38,155 from the original base price of $28,100. The base Laredo starts at just $26,875. My test unit had Sirius satellite radio, a wonderful and worthwhile investment if you like a variety of programs and hate radio commercials. It cost just $195 to install, and the first year’s monthly fees are included. If you want to hear Bluegrass or Jazz or even endless news reporting you need to check out this new kind of radio.